As a local Atlanta-based coin dealer, we are strong believers that relationships are the key to a coin dealer’s success as well as the success of their customers. While technology and e-commerce have changed the way that people conduct business, there are still some businesses and their customers that benefit from face to face transactions, such as local coin and bullion sales. While establishing local relationships isn’t always possible; especially for individuals that live in more rural areas, individuals that live in or near large metropolitan areas should have plenty of potential coin dealers from which to choose. In this article, we’ll highlight six reasons why we believe that establishing a local relationship with a coin dealer is likely to benefit most coin collectors. A common misconception is that the best prices for coins and bullion can be found online through large national coin companies or auction sites, such as eBay. While there’s no question that many terrific deals can be found online, local coin dealers that place a high emphasis on customer relationships are often willing to meet or beat leading online rates. However, these preferred rates are typically only offered to regular customers with whom a coin dealer has a long standing relationship. It’s in the coin dealer’s best interest to keep his or her valued customers happy, even if it means reducing their profit margins. Most coin dealers offer standard buying rates for specific coins, but they’re also willing to provide their regular customers with preferred rates. Whether an individual is slowly liquidating a coin collection from an estate, or a regular coin buyer is interested in some profit taking, customers that have shown loyalty to a coin dealer are likely to receive higher prices when selling coins and bullion. If you don’t have a relationship with a local coin dealer, you should not expect to receive more than a coin dealer’s standard buying rates. Coin collectors know how difficult it can be at times to obtain newly released coins by the U.S. Mint or coins and sets that are in high demand in the marketplace. Coin dealers take pride in meeting the demands of their customers; especially their most loyal and valued customers, and oftentimes will notify their customers once they receive coins in stock that are on their customers’ wish lists. 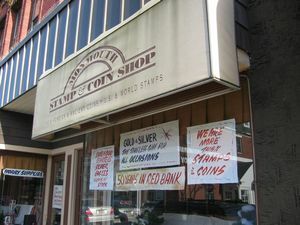 If you’ve ever wondered why your local coin dealer, with whom you have not established a relationship, never has the items in stock that you’re interested in acquiring, this is likely because they’re busy meeting the needs and demands of their regular customers. No matter how many pictures you see of a coin, or how high of a resolution camera is being used, the fact of the matter is that nothing compares to inspecting a coin in person. There are nuances that can’t be captured in a two dimensional picture, which could impact the price that you’re willing to pay for a coin. While most online coin dealers and auction sellers are fairly reputable, and are willing to offer a money back guarantee, this is not always the case. Even in situations where you’re offered a refund, often you’re required to pay the return shipping charges. There’s also the time and hassle of having to send a coin back and wait for a refund. We live in an immediate gratification society, and even though many individuals are disciplined enough to wait for a coin or coins to be delivered, you’re not likely to find an individual that wouldn’t prefer to receive a coin now as opposed to later. Buying coins from a local coin dealer eliminates delays, as you shouldn’t pay for a coin unless you receive it in person. While there are exceptions, such as deposits made for special orders, more times than not, you can expect to receive a coin at the time of payment. This also eliminates the possibility of having coins lost or damaged in the mail. Even when coins are properly insured, there’s typically a delay involved before the delivery service will reimburse the buyer for the cost of the coins. In this day and age, nearly all of our purchases can be or are being tracked. While this data is typically compiled for marketing purposes to better meet our needs, some customers prefer privacy when it comes to their transactions. When buying coins or bullion online, typically payment is made by credit card, a wire, or other popular payment services, such as Paypal. While these are convenient forms of payment, the potential downside is that all of these purchases can be tracked by various companies and agencies. Local coin dealers respect their customers’ privacy, and while you shouldn’t expect your coin dealer to bypass any laws, they’re typically willing to keep transactions private to the extent that they’re able. In summary, we’ve highlighted six reasons why you should consider establishing a relationship with a local coin dealer. Coin dealers are typically willing to provide their regular customers with preferred rates, both on the buy and sell side. They are also typically willing to provide their valued customers with early access to new inventory. Additionally, conducting business locally allows you to inspect your coins in person and take immediate delivery of the items. Lastly, if privacy is a concern to you, your transaction is much more likely to be kept confidential when conducting business locally as opposed to buying and selling online.